The medieval craft guilds developed as the forerunners of the present professional institutions. Each, within its own industry, set and regulated the standards of professional competence that customers might expect to receive when trading with their members. Competence and common standards were achieved by the development of systems of training through master and apprentice relationships: successful apprentices could themselves become masters of the craft and therefore members of their guild of which the badge of office was a livery – an identifiable gown – hence the title of livery company. Complaints about professional incompetence were investigated by the relevant guild and, if proved, the complainant would be compensated and the incompetent practitioner would be deprived of the right to practise the trade. In addition to this professional self-regulation the guilds also operated a system of financial support (or insurance) for those of their members falling upon hard times. There are now 110 livery companies of which over thirty have been founded in the last 50 years. 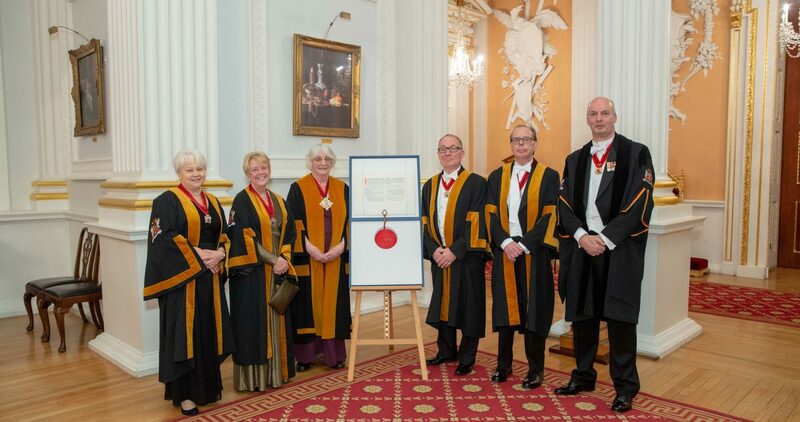 The professional self-regulating function of most companies has been ceded to the appropriate professional institutions but involvement with beneficial giving to their trades and with the annual election of the Lord Mayor of London are still valued roles for all companies. Common Hall is a term used to describe a gathering of Liverymen, and often associated with an election. However Common Halls are also held for some individual companies for reasons other than elections, or indeed for their own elections. The election of the Sheriffs and Lord Mayor in Common Hall occurs each year on Midsummer Day (24th June – Sheriffs) and Michaelmas Day (29th September – Lord Mayor). When the quarter day falls at a weekend, as in 2012, the election takes place on the following Monday. Normally, one of the Sheriffs is an Alderman, who will hope to go on to become the Lord Mayor of London. The other, sometimes referred to as the non-aldermanic sheriff, has no further civic ambitions after completing his year at the Old Bailey. Voting is done by a show of hands and a vocal affirmation or negation rather than by a ballot box. Both Common Halls follow a similar pattern, and arrangements for the Livery are broadly identical at each. The key difference is that the Lord Mayor’s election is preceded by a service at St Lawrence Jewry, to which Masters (and others) process. There is an opportunity for questions at the Sheriff’s election (nowadays very seldom exercised), and this can affect the timings, but both elections should end by about 1pm. Only Liverymen clothed prior to May the previous year are eligible to vote. The reason for this rule goes back many years and was to prevent liveries packing their membership at the last moment to get their favoured candidate elected.